A swarthy hero, a beautiful princess, and a dagger than can turn back time with a jewel button. No this isn't the video game, but it's like you're watching one. Made for people who enjoyed the later "Pirates" movies, and also those who don't care when time travel lowers the stakes so much that no drama exists. intense sequences of violence and action. Don’t be fooled by the name Disney preceding the title “Prince of Persia,” this is not kids fare. It is rated PG-13, and for good reason. It’s one of those movies that appear harmless enough on the outside, but for younger children the excessive violence may be a little too much. Dastan (Jake Gyllenhaal) begins life as an orphaned boy on the streets of a Persian city stealing food to survive. Yes, basically the story of Disney’s “Aladdin,” but I digress. One day the ruler of Persia, King Sharaman, sees Dastan stand up to a few heartless men who are harassing his friend. This causes the King to essentially adopted Dastan into the royal family, because of the honor and courage in his heart. Dastan grows up as nobility, with two other brothers who are blood of the King, Tus and Garsiv. Tus is next in line for the throne when after his father is gone. Dastan is your typical manly, alpha male super stud sporting long unruly hair, perfect action hero three day stubble, and a soft spot for the ladies. He’s also apparently master of, or possibly originator, of parkour. Dastan flies from roof top to roof top attacking enemies, and then disappearing over a wall. It’s all very exciting. The plot involves Dastan being framed for murder, the attacking of an innocent city, and a dagger that apparently can turn back time. Much more of the plot will remain unexplained here, but don’t worry, once you meet Princess Tamina she’ll let you in on the whole thing. The Beautiful Tamina’s main job as a character is to facilitate the entire espousing of the plot when we don’t know what is going on. Doesn’t matter whether they’re running from foes, or relaxing during a sand storm, Tamina is constantly explaining the plot and how the dagger came to be. It’s funny, because even after her constant blabbering about ancient times, and gods and such, the reason why the dagger exists or the Sands of Time for that matter stay quite a mystery. The action in “Prince of Persia,” takes on the generic quick cut, fast camera movement action that has become so prevalent is action movies nowadays. Dastan dispatches enemies with deadly efficiency, but actually watching him do so is a strain on the eyes and brain as the nauseating editing shifts back and forth between body part close-ups so fast it’s hard to tell what’s going on at all. But, don’t worry, the moments we’re supposed to think are really dramatic are slowed down to ultra slow motion. Yes, we even have trusted arrow cam shots where a the camera follows the arrow from its source to its destination, like we did in “Robin Hood,” and any other modern action-centric period piece. No thought here, it’s all just your generic popcorn fluff. There is a bright spot however; the brilliant actor Alfred Molina makes an appearance as a wise-cracking man named Sheik Amar. Like many other films, Molina is a beacon of light in an otherwise dim movie experience. Even the appearance of Ben Kingsley is greatly underused. Just another movie where Kingsley is called upon to stand there and look menacing with his clean shaven head. 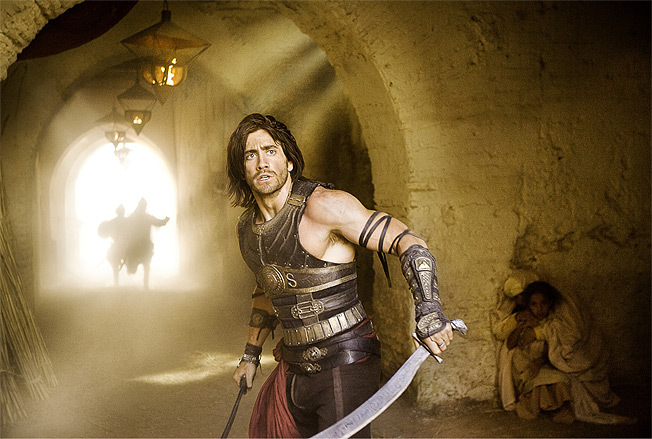 “Prince of Persia” is a film too violent for children, and too dumb for adults. It doesn’t even really meet the “popcorn fun” level. It wallows somewhere in mediocrity, and by the time its all over you may be wishing you had that time traveling dagger so you could turn back time and make it so you never went to “Prince of Persia” in the first place.